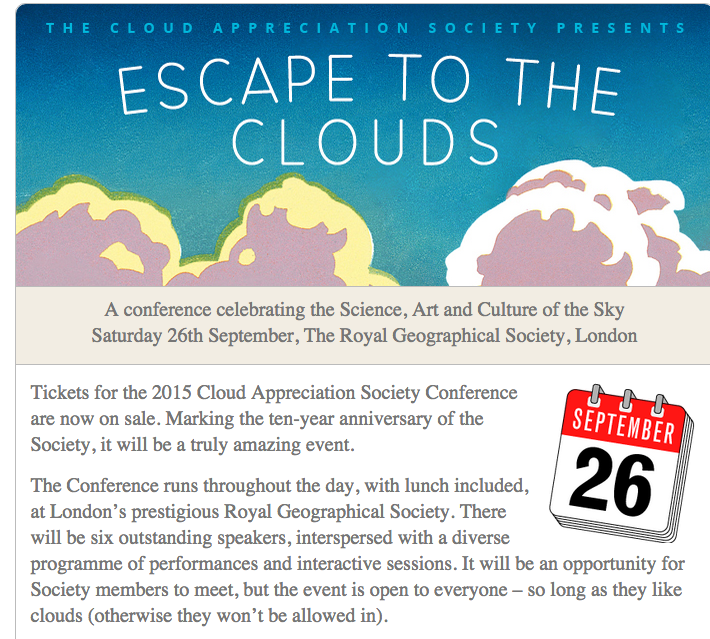 I spent Saturday this week down at the Royal Geographical Society in London, for the first Cloud Appreciation Society Conference. The society has been going for 10 years now, and I was an early member. I went with my colleague Claire, a fellow cloud geek. There was an article on Gavin Pretor-Pinney: the founder in the Telegraph a few days ago, providing some background on the society. There was an eclectic array of speakers and musical interludes, and I will be posting more details on some of the individual sessions over the next week or so when I have time. There was also news of an update to the Cloud Spotter iPhone app. Here's the short video that kicked off the conference. Cloud Appreciation Society - Somerset Aspirations from Wayfarer Media Ltd on Vimeo. Debut screening at the CAS's conference at the Royal Geographical Society on September 26th, 2015.